The KUH-1 Surion amphibious helicopter performed its first test flight in January 2015. The Surion amphibious version is being developed for the Republic of Korea Marine Corps. The KUH-1 Surion amphibious helicopter is expected to operate from the ROKN’s Dokdo-class landing platform helicopter (LPH) assault ships. The Surion amphibious helicopter features a crashworthy airframe. The KUH-1 Surion twin-engine amphibious helicopter is being developed by Korea Aerospace Industries (KAI) to enhance the Republic of Korea Marine Corps’ (ROKMC) amphibious landing operations. When operational, the helicopter is expected to operate from the Dokdo-class landing platform helicopter (LPH) assault ships of the Republic of Korea Navy (ROKN) to transport troops and military equipment in littoral operations. The amphibious copter is derived from the Surion Korea utility helicopter (KUH), which was developed by KAI and Eurocopter (now Airbus Helicopters) for the South Korean Army and Air Force. The Surion-class military and public helicopters also include KUH-1 Surion medical evacuation (medevac) version and KUH-1P Surion police version. Korea Aerospace Industries (KAI) was selected by the Republic of Korea (ROK) Defense Acquisition Programme Administration (DAPA) as the priority negotiator for the design and manufacture of Surion amphibious variant in April 2013. Development of the KUH-1 Surion amphibious task helicopter programme, worth approximately KRW800bn ($745.92m), was started in July 2013 and is scheduled for completion in January 2016. KAI is expected to manufacture 40 helicopters, with deliveries scheduled to begin in 2017. 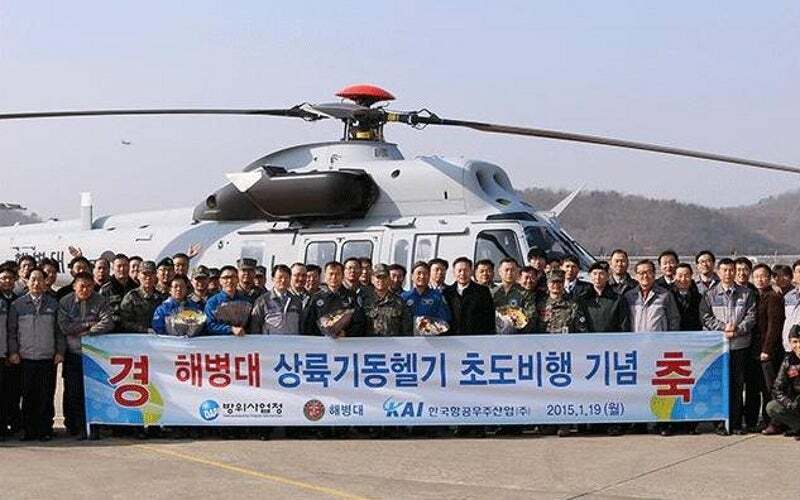 The helicopter made its first test flight in Sacheon, South Gyeongsang Province in January 2015. Flown by two test flight pilots and two technicians for approximately 30 minutes, the helicopter successfully performed forward flight, backward flight, hovering flight as well as a change of direction at 80ft above the ground. "The cockpit is fitted with bullet-proof windscreens to protect crew members from 7.62mm small arms, while providing increased situational awareness." The amphibious variant features crashworthy airframe, and four main and four tail rotor blades. Its undercarriage consists of two main single-wheeled units placed under the fuselage and a double-wheeled nose leg. The helicopter has an overall length of 19m with rotor blades, and a height of 4.5m. The main rotor has a diameter of 15.8m and a blade chord of 0.55m. The tail rotor diameter and blade chords are 3.5m and 0.25m respectively. Surion is operated by a pilot and a co-pilot and accommodates up to 11 troops. It is equipped with wire cutter, double rotor control system, integrated flotation system, and a balancer for tail rotor. The cockpit is fitted with bullet-proof windscreens to protect crew members from 7.62mm small arms, while providing increased situational awareness. The self-sealing / anti-explosion fuel tanks are designed to withstand 12.7mm / 14.5mm bullets. The amphibious helicopter is equipped with tactical air navigation (TACAN) for en-route navigation and landing aid. The Rockwell Collins high-frequency radios, capable of operating at extreme altitudes and temperatures, provide voice communication during amphibious operations. The countermeasures include radar warning receiver (RWR), missile warning receiver (MWR), laser warning receiver (LWR), and countermeasures dispenser system (CMDS). The base version is powered by two GE T700-701K turboshaft engines, each generating a maximum output power of 1,383kW. It can reach a speed of 269km/h and a range of 260km, and has a service ceiling of 260km. The main and tail rotors are designed to operate at speeds of 272rpm and 1,321rpm respectively. "The amphibious helicopter is equipped with tactical air navigation (TACAN) for en-route navigation and landing aid." The Surion amphibious variant has a maximum take-off gross weight of 19,200lb and fuel capacity of 2,415lb, and features a main gear box (MGB) with run-dry capability. An auxiliary fuel tank is installed to provide long endurance. In October 2013, Rockwell Collins was selected by KAI for the supply of HF-9000 high-frequency radio system, on-site training and documentation. KAI partnered with Dutch Aerospace Centre (NLR) for defining Ship Helicopter Operational Limitations (SHOLs) for Surion flight operations onboard the ROKN ships.